If you had to name two things that you believed to be the antithesis of Christmas, what would your first answer be? Mine would be the Grinch – at least until his heart grows three sizes and he returns all of the presents to Whoville – and Donald Trump. Let’s face it, you wouldn’t really want either sitting round your table for Christmas dinner when you’re trying to get in the festive spirit. It’d put a bit of a dampener on the mood to say the least. And now the New York Daily News has merged the two together for their front cover, creating an actual nightmare that will haunt my dreams for the foreseeable future. 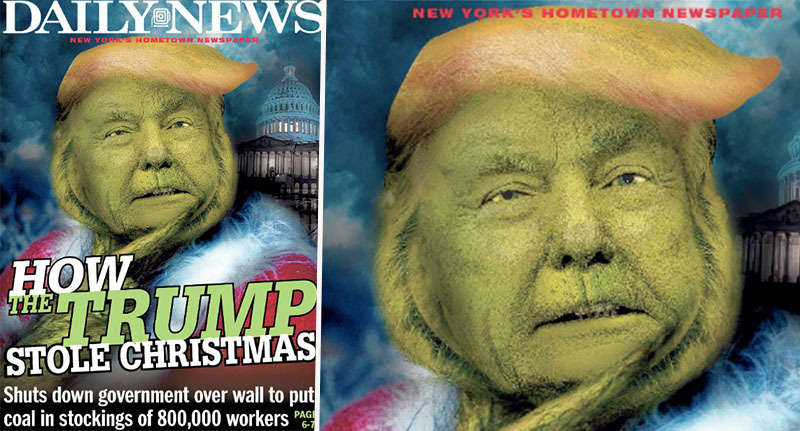 Making a pun out of the popular 2000 adaption of the Dr. Seuss tale, the New York Daily News’ headline reads: ‘How The Trump Stole Christmas!’ Posting to their official Twitter page yesterday (December 21), the publication shared with their followers a glimpse of today’s front page. The publication used their platform to call the President out for the recent government shutdown, whereby Trump threatened to close down part of the government on Friday if he didn’t get funds for his border wall. As reported by Huffington Post, nine government departments and several agencies with hundreds of thousands of workers gradually came to a standstill as a result of the shutdown, before funding lapsed completely at midnight when the White House and Senate adjourned without reaching any compromise. The cover story from New York Daily News went on to call the shutdown a ‘Christmas tragedy,’ saying it ‘complicates the lives’ of federal workers over the holidays. Trump has remained active on Twitter throughout the shutdown (surprise), again calling any news reports ‘fake’ and informing his followers that he’s waiting to see if the Democrats will help him ‘to protect America’s Southern Border’. He then posted a video captioned: ‘OUR GREAT COUNTRY MUST HAVE BORDER SECURITY!’ in which he spoke about drugs ‘pouring in,’ human trafficking, and gangs in an attempt to persuade people that a wall would be a good thing. Alright, disclaimer: at this point I don’t even want to compare him to the Grinch anymore because he doesn’t deserve it – it’s offensive to the lovable green character. Although the picture is horribly amazing. This isn’t the first time New York Daily News has fired shots at Trump either; in recent months, the publication has published many covers depicting the President in a negative light. And to be honest, I’m all for it.